Constant torque, and reduced torque of V/F control. Built-in BRD circuit (Optional resistor) for 15, 20 HP only. External dynamic braking unit (option) for 25 HP & above. Braking resistor is not integrated in the inverter. Please install optional braking resistor or dynamic braking unit when large control torque is required. RV(Reverse), CF-ICF-4(Multispeed command),JG(Jogging),DB(ExternaI DC braking), SET(Second motor constants setting), 2CH(Secondaccel./decel. ), FRS(Free-run stop), EXT(External trip), USP(Unattended start protection), CS(Change to/from commercial power supply), SFT (Software lock), AT(Analog input selection), SET3(Third motor constants setting),RS(Reset), STA(3wire start), STP(3-wire stop), F/R(3-wire fwd/rev), PID(PID On/Off), PIDC(PID reset), CAS(Control gain setting), RS(Reset), STA(3wire start), STP(3-wire stop),F/R(3-wire fwd/rev), PID(PID On/Off), PIDC/PID reset), CAS (Control gain setting), UP/DWN(Remote controlled accel/decel), UDC(Remote controlled data clearing), OPE(Operator control), SF1-SF7(Multispeed bit command 1-7), OLR(Overload limit change), TL(Torque limit enable), TRQ1, TRQ2(Torque limit selection (1)(2)), PPI(P/PI selection), BOK(Brake verification), ORT(Orientation), LAC(LAD cancel), PCLR(Positioning deviation reset), STAT(90-degree phase difference permission), NO(Not selected). Output frequency, output current, scaled value of output frequency, trip history, I/O terminal condition, input power, output voltage. V/F free setting (up to 5 points), frequency upper/lower limit, frequency jump, accel/decel curve selection, manual torque boost value and frequency adjustment, analog meter tuning, start frequency setting, carrier frequency setting, electronic thermal free-setting, external frequency output zero/span reference, external frequency input bias start/end, alalog input selection, retry after trip, restart after instantaneous power failure, various signal outputs, reduced voltage start, overload restriction, default value setting, deceleration and stop after power failure, AVR function, fuzzy accel/decel, auto-tuning (on-line/off-line), high torque multi operation. OPE-S(4-digit LED) Option: OPE-SR(4-digit LED with potentiometer), SRW-OEX (Multilingual (English, French, German, Italian, Spanish, and Portuguese) operator with copy function. High starting torque of 200% or greater at 0.5Hz . High torque of 150% at approximately OHz is accomplished when SJ300 drives a smaller motor by one frame size. Brake ON/OFF sequence can be easily integrated with this feature. Roational fluctuation at low speed has been drastically reduced to enhance process stability and precision. Modbus RTU, and Ethernet with communication options. SLV selected, set carrier frequency more than 2.1kHz. The braking torque at capacitive feedback is the average deceleration torque at the shortest deceleration (stoppage from 50 Hz) of the motor itself. It is not the continuous regenerative braking torque. And the average deceleration torque varies with motor loss. This value decreases when operating beyond 50/60 Hz. If a large regeneration torque is required, the optional braking resistor should be used. Operating frequency, time and braking force variable. The frequency command is the maximum frequency at 9.8V for input voltage 0 – 10 VDC, or at 19.6 mA for input current ~ 20 mA. If this characteristic is not convenient, contact Polyspede. AVR function, curved acceleration/deceleration, upper/lower limiter, 16-stage speed, fine adjustment of start frequency, carrier frequency change (0.5 to 10 Kz) frequency jump, gain and bias setting, process incing, electronic thermal level adjustment, retry function history monitor, 2nd setting selection, auto tuning, Fan on/off selection PID control, carrier frequency change, frequency jump. Munsell 8.5YR6.2/0.2, cooling fins in base aluminum. The torque calculation software (sensorless vector control) developed by Polyspede ensures accurate torque control throughout the entire frequency range, even with general purpose motors. Intelligent terminal system allows you to select only the necessary functions from a full lineup of enhanced functions. 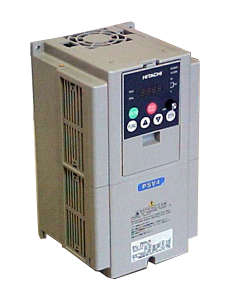 The powerful and intelligent SJ100 inverter series solves your applications requirements for high torque at low speeds. 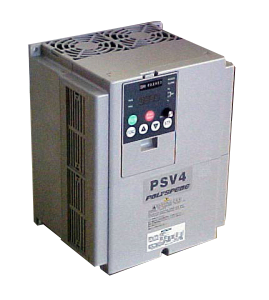 The PSV6 can be started by pushing the RUN button or selection of a terminal mode. Speed can be changed by standard potentiometer, keypad or external signal. Functions are grouped for quick, easy settings. Installation space is reduced by 56% from the J100 series and 11% from the compact L50 series. UL, C-UL standards C-tick (Australian EMC requirements, with dedicated noise filter). 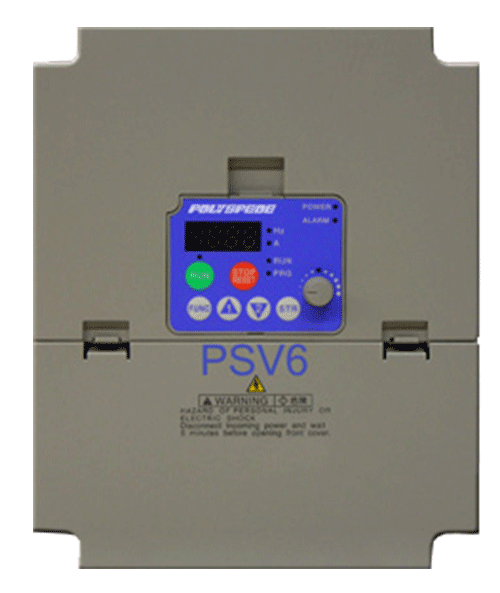 The line-up is compatible with DEVICE NET, PROFIBUS, etc. with network options.